Robert Indiana, an American painter, sculptor, and printmaker, is frequently associated with Pop Art, though he has said he prefers calling himself a "sign painter." Indiana is most famous for his Love sculpture series, which can be seen in more than 30 locations around the world. 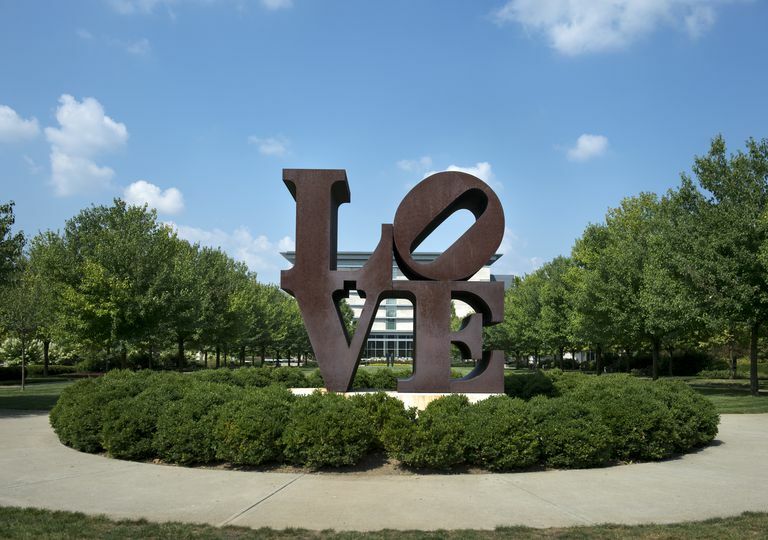 The original Love sculpture is located at the Indianapolis Museum of Art. Indiana was born "Robert Earl Clark" on September 13, 1928, in New Castle, Indiana. He once referred to "Robert Indiana" as his "nom de brush," and said it was the only name by which he cared to go. The adopted name suits him, as his tumultuous childhood was spent moving frequently. Indiana says he lived in more than 20 different homes within the Hoosier State before the age of 17. 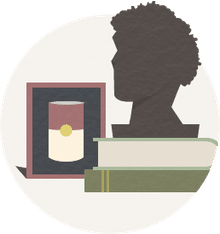 He also served in the United States Army for three years, before attending the Art Institute of Chicago, the Skowhegan School of Painting and Sculpture and Edinburgh College of Art. Indiana moved to New York in 1956 and quickly earned a name for himself with his hard-edge painting style and sculptural assemblages and became an early leader in the Pop Art movement. Best known for sign-like paintings and sculpture, Robert Indiana worked with many numbers and short words in his work, including EAT, HUG, and LOVE. In 1964, he created a 20-foot "EAT" sign for the New York World’s Fair that was made of flashing lights. In 1966, he began experimenting with the word "LOVE" and the image of the letters arranged in a square, with "LO" and "VE" on top of each other, with "O" tilted on its side was soon featured in many paintings and sculptures that can still be seen today around the world. The first Love sculpture was made for the Indianapolis Museum of Art in 1970. The 1973 Love stamp was one of the most widely distributed Pop Art images ever (300 million were issued), but his subject matter is drawn from decidedly un-Pop American literature and poetry. In addition to the sign-like paintings and sculpture, Indiana has also done figurative painting, written poetry and collaborated on the film EAT with Andy Warhol. He reintroduced the iconic Love image, replacing it with the word "HOPE," raising more than $1,000,000 for Barack Obama's 2008 presidential campaign. Hobbs, Robert. Robert Indiana. Rizzoli International Publications; January 2005. Indiana, Robert. Love and the American Dream: The Art of Robert Indiana. Portland Museum of Art; 1999. Kernan, Nathan. Robert Indiana. Assouline; 2004. Ryan, Susan Elizabeth; Indiana, Robert. Robert Indiana: Figures of Speech. Yale University Press; 2000. Weinhardt, Carl J. Robert Indiana.